If you are totally into movies, you probably have several apps or browser extensions that can help you with your obsession. MovieCenter Search looks like one of those browser plug-ins that are there for you. However, our security experts say that this application is a potentially unwanted program. It means that the extension is not an immediate computer security threat, but it may have certain features you would find undesirable or disturbing. Therefore, to avoid potential security issues, you should consider removing MovieCenter Search today. It is easy to accomplish that manually. If you want to know more about the program, continue reading this description. It probably would not surprise you if we said that we had seen similar applications before. According to the data we have gathered, this browser extension is actually rather similar to Gamescenter search, Arcadecenter Search, and Videocenter Search extensions. 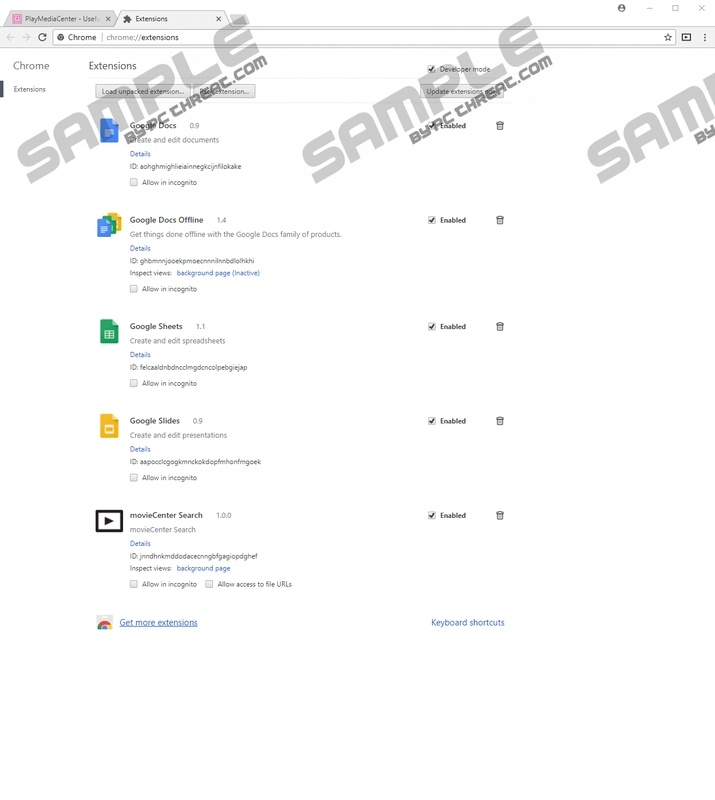 Seeing how there is the word “search” in all of the keywords, we can assume that the extensions affect the search engine settings when they get added to the Chrome browser. If you have MovieCenter Search on-board, you must have noticed that already. And that is also one of the reasons these programs may look like browser hijackers at first, but that is not really the case. If you have other browsers installed on your computer, you must have also noticed that MovieCenter Search affects only the Chrome browser. This extension is compatible only with this one browser, and it makes the job of protecting the users from it and removing it from the affected systems easier. Also, it makes it easier to check the official websites where users can download and add the extension to their browsers. From what we have seen, MovieCenter Search can be found at playmediacenter.com, and even the Chrome Web Store. We actually mentioned this countless of times, but when a program has an official homepage, it can hardly be called a malware infection. It does not trick users into installing it. Even if you say that you do not remember adding MovieCenter Search to your browser that is probably because you did not notice that. You see, apart from the official channels, potentially unwanted programs may use several other ways to spread across the web. They are quite often bundled with freeware in one third-party installer. If you tend to download freeware applications from third-party file-sharing sites often, then it is only natural that you have quite a few unwanted applications on your computer, and MovieCenter Search happens to be one of them. Although these extensions and other similar applications will not try to infect you with malware, they can still slow down your browser, consequently exposing you to potentially corrupted content. For example, MovieCenter Search will modify your default search settings. It will change your search provider to play.eanswers.com. At first, it will look like a decent search page, but the reality is that all your search queries through that site will be redirected to search.yahoo.com. What’s more, the search results on Yahoo! Search will be redirected according to your likes and preferences, so it means that MovieCenter Search will monitor your online activity to figure out your favorite websites and the search keywords you use the most often. It is not that dangerous if the program uses it only for online advertising and marketing. However, MovieCenter Search and other similar programs cannot decide what kind of content exactly is displayed in the modified search links. It does not review it, and if this presents a security loophole that can be easily exploited by malevolent third parties. Although it is very unlikely that you will get infected with malware via MovieCenter Search, the risk is still there, and you should not take it. Please remove MovieCenter Search from your computer following the instructions you will find below this description. Manual removal is not complicated, but if you feel that it is too much for you, you can always rely on a powerful antispyware tool. What’s more, a computer security program of your choice will safeguard your system from other unwanted applications, too. However, you have to realize that your web browsing habits are also important if you want to avoid similar threats in the future. Type %LocalAppData% into the Open box. Press OK.
Navigate to Google\Chrome\User Data\Default\Sync Extension Settings. Remove these files: Preferences, Secure Preferences, and Web Data. Quick & tested solution for MovieCenter Search removal.